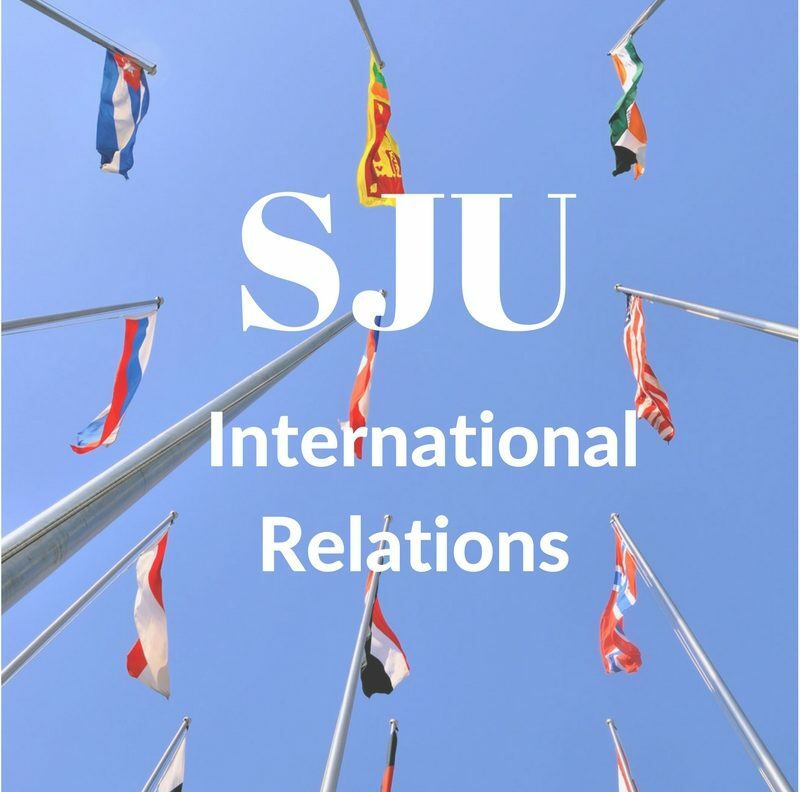 What brought you to SJU? Do you remember why you declared an IR major/minor? So, financial reasons brought me to SJU. My father works at another Catholic college in Philadelphia, so I was able to get a steep discount at SJU. The reason I chose SJU over Villanova or another Catholic school is that SJU had a Music major, which was what I had initially declared. Eventually, I realized I did not enjoy Music in a class setting and I switched majors. I had a deep interest in Asia, and decided to major in Asian studies and minor in IR. Later, my IR minor developed into a second major. Outside of class, I worked as a Japanese tutor with the Office of Learning Resources. Aside from that, I was a member of the Japanese Culture Club for a bit, and I also represented the Asian Studies and International Relations programs at open houses for prospective students in my junior and senior years. There are two major factors that shaped my current career; my decision to take Japanese language course and Dr. Fukuoka encouraging me to study abroad at his alma mater, Sophia University in Tokyo. The ultimate reason I came to Japan in the first place was due to the support my professors at SJU gave me. I guess another thing was that I got a little tired of life in America and I just wanted to try something new. I hadn’t planned to stay in Japan after my study abroad experience, but I made some amazing friends here and enjoyed my life here more than anywhere else. I ended up getting a job as an assistant English teacher in a public Junior High School, as that’s one of the easiest jobs to get as a foreigner, and native English Speaker in Japan. Additionally, I needed to have a full time job in order to renew my visa, so the Japanese immigration system has been a big force in shaping my career so far. I recently got a job at a private high school as a full time English teacher and I want to continue down this career to see where it goes. I would say that the professors are really what makes the IR department special. I had most of my classes with Doctors Fukuoka, Baglione, and Carter. They were always incredibly approachable and easy to talk to. I could tell that they truly care about their areas of study and teaching. I studied abroad at Sophia University in Tokyo, and the biggest difference I found was how the teachers interact with the students. The teachers at Sophia encouraged a wide social gap between the students and the teachers, but I never felt that way while studying at SJU in the IR department. For anyone who plans on working abroad, I would say that patience and being comfortable looking/feeling out of place are something that one would need to get used to. I grew up mixed race in the US, with half of my family coming from Colombia, so I already had some perspective surrounding not fitting the norm. I’ve had some friends leave the country because the culture shock was a little too much for them and they felt uncomfortable with life here. Another issue that I’ve seen is that some of my female friends feel really uncomfortable living in Japan because it’s a fairly patriarchal society, making it very hard for them to make advancements in their careers. It’s an unfortunate, but very real aspect of life here, and I don’t begrudge anyone who chooses to move back to their home countries, I could honestly see myself doing the same if I were in their shoes. Embrace the randomness of life. 3 years ago when I was about to leave the US for Japan, I had no intention to stay here, but it just happened. I have gone through a lot of change in the past few months; originally planning to go to graduate school, but then this opportunity to apply for a job as a non-assistant English teacher presented itself, and I just took it. It’s okay to not have a set plan for you life, I never really did, and things seem to be working out. Even when I was in high school, or college, people would tell me that I needed to know what my career would be, as though an 18 year old, or a 22 year old could have the perspective to know the world outside of academia and decide what they wanted to spend the rest of their life doing. It really just doesn’t make sense. The thing I would say, is the same thing I’m telling my students graduating from junior high school; just find the thing that makes you happy and do it. Don’t care too much about what other people want you to do, or what you think society wants you to do, just find something that gives you joy, happiness, and fulfillment, and do that. I would like to someday become a university teacher, especially in politics or history. I don’t really have many hard career goals because I feel like they can be kind of restricting. I’m always open to change, but I know that I enjoy teaching and I wish to continue to pursue that career. Who knows what the future holds, though!